I'm retired with a working husband. Married 33 years. I live with 2 corgis and 3 cats. Love to garden, read and just plain enjoy being retired. One daughter living in TN. No grands yet. Toby was stolen from his backyard this morning in Arcadia, CA. If you have any news you can contact me thru here or others on IG @corgilexi or @corgella. 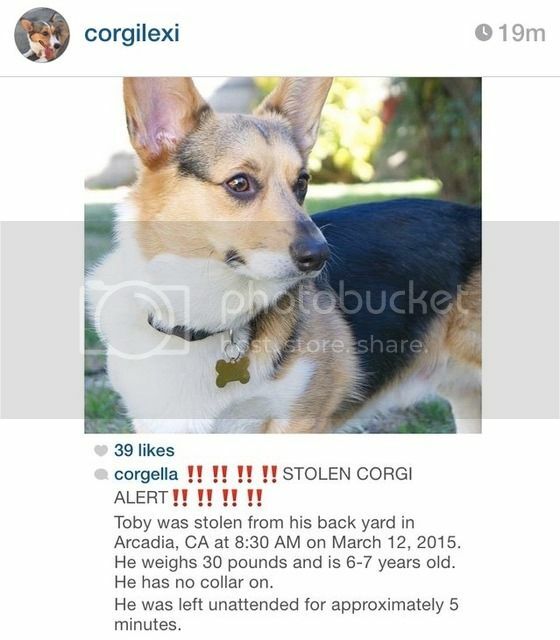 It was also posted on the SoCal corgi FB page. No problem, Linda. Hope you feel better! Hope all is well! Merry Christmas!!!! Linda, Does Max seem well after his surgery? I remember that the path report was not conclusive. Does he have a good outlook as far as you know? I hope so as we sure want these big handsome fluffs to stay well. Thanks for the comment on the post, we appreciate it! Did you ever see my pic of Sage with the Irish Wolfhounds? She was young and a bit intimidated by them...haha! I always thought I would like to have 1-2 but never will. Hi Linda, This has been a long winter! -18 tonight with windchills colder than-40. Most schools are already closed due to the blizzard but also due to the windchills. Not nice at all! Linda, Thanks for your kind thoughts about the deaths of Lady and my bro-in-law. I must mention that it happened about 25 years ago -- I neglected to make this clear in my post. I learned only last weekend that Lady was over 20 years old and wandered off to die just 3 weeks after MIke's death -- perhaps not coincidentally. Just a funny-lookin' mutt, and an important dog.